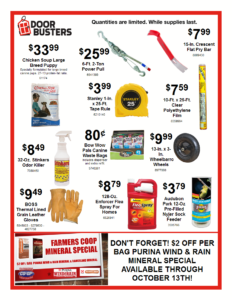 Stop by the Mena Farmer’s Co-op to take advantage of our October Doorbuster Specials. Save on hardware, hunting products, pet food & supplies in October. These Door Buster Specials are available only at the Mena, Arkansas location, while supplies last, quantities are limited. Don’t forget, $2 per bag savings on Purina Wind & Rain and Rangeland Cattle Mineral through October 13, 2018! 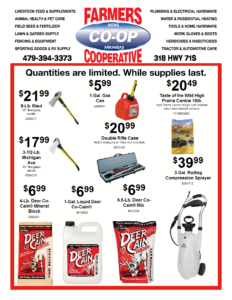 October Doorbuster specials valid October 1 through October 31, 2018, at Farmers Coop in Mena, Arkansas. While supplies last! This entry was posted on Friday, September 28th, 2018 at 4:08 pm	and is filed under Events, News & Updates, Promo. You can follow any responses to this entry through the RSS 2.0 feed. Both comments and pings are currently closed.